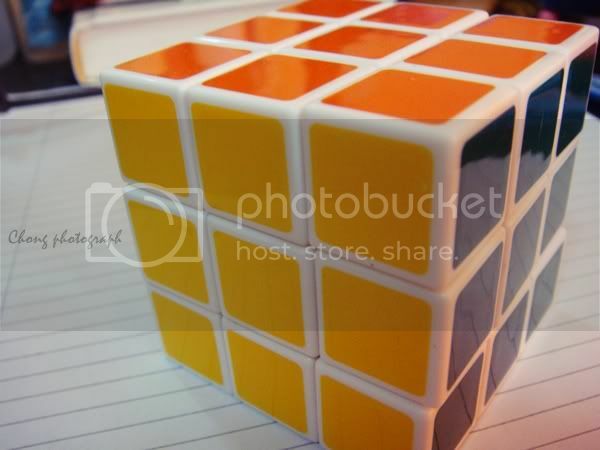 Never thought that I would own a rubik's cube myself, more over it's in white color one. Quite excited when I first hold it in my hand, although I haven't master the solution, I just know some of the steps which I think I might forgot already. I'll learn it before I leave here, as my sifu is over here; hope that I can remember all the steps, must! I can't concentrate to my study now, maybe it's because I hate the first subject: chemical bio-organic, headache when I read so many structures and mechanisms, it is impossible for me to memorize all these terror things, impossible! Can't even finish a note in few hours time, even if I finished, I can't recall anything. Oops. Everytime you don't talk to me, I die a little inside.